Vittoria has a long tradition of success: its tubulars and treads have won the greatest number of races in history. Pro series cotton tyres benefit from casing with 320 TPI, providing exceptional flexibility and lightness, and feature the new ISO grip compound for even more grip and safety than before. Corsa CX is the world's best-known and most-used tubular Cotton tires, the choice of champions: exclusive to Vittoria, the 320TPI Core spun casing confers a uniquely supple ride and exquisite handling. PRB 2.0 puncture resistant belting increases the flat prevention properties of the Corsa Pro CX up to 40%. I love these tyres! They are hard to find now, being an older model in the line-up, but they roll excellently and I have found them very puncture resistant and durable. They also have removable valve cores, so you can add sealant easily if you want to increase the puncture resistance. Unbeatable value for a top-notch, race day tyre. Riding 25mm, good price, efficient, it does the job. I`m getting 6k on the front tire and 2.5k on the back. Fantastic all-round tyre for racing and training....only eclipsed by the newer graphene tyre from Vittoria. Excellent quality for the price, for years it was the best all round tubular. Very good grip on wet, latex inner tube and 320tpi makes this tubular great choice. Superb tubular tires. Supple, low rolling resistance. Yet I`m able time and again to ride these until I wear down to the casing - with no flats in between. I've always loved these tubulars they are perfect for NZ's dead damp roads and so disappointed they are discontinued in favour of the more expensive Graphene's but I'll get used to it and move to G+ once Corsa CX's have run dry. Lightweight and supple, these tubulars are fast and offer good cornering grip. On the other hand, latex inner tubes that contribute to these qualities, compels to everyday pumping up, as they lose air much faster than butyl inner tubes. 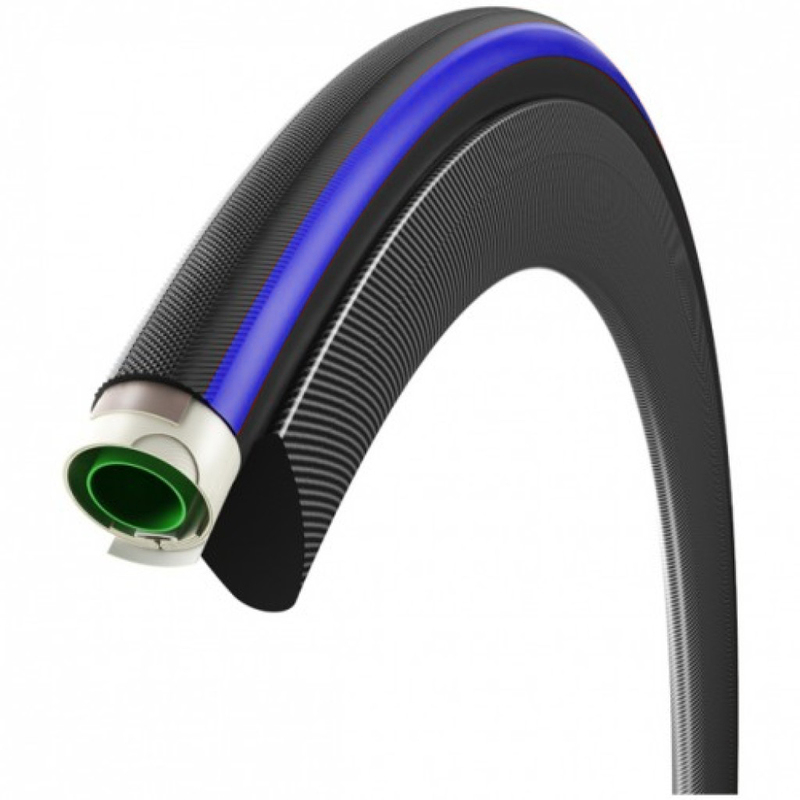 Great tubular tyre. Well made, easy to fit, fast, looks good, excellent traction even in wet and comfortable to ride on at around 100-110 psi. Long lasting, but does not tolerate glass or flint cuts very well. The inner tube is pretty close to the surface. I have found Selley's ultra repair flexible glue works well for minor cuts. Hard to beat this tyre and great price from Merlin. Superb price on an increasingly rare product. Yes, they are STILL the best tyres out there!! Glad to find these in stock again, and at a bargain price. I have used all the popular tubulars including Conti Competition, Challenge Forte, Schwalbe One etc. and the Corsa CX is by far my preferred choice. They are light, good rolling resistance but most importantly the most puncture resistant. Get them whilst you can! One of the fastest tubulars still available! Some claim faster than the new graphene tyre! Great price and fast delivery! Excellent tyre. Very puncture resistant. Good grip. Rode a race in very rainy weather without any failures. I am now 65 years old and always use Vittoria tubular tyres. My review - Corsa Cx 111, its the best on speed and down the hill, I trust it 100%, very good, sticks to the road for my safety. Thanks to Vittoria for making it. These tires are amazing going around corners in crit races! Great tire. Supple riding and good grip. If your frame can take it, get the 25 mm for even better cornering and comfort with minimal weight penalty. Side walls are not very puncture resistant and they wear rather quickly. But the perfect tubular for your next road race in hilly terrain. Great tyre. Very lightweight, and perfect ride. Lower distance before punctures than my clinchers, but I guess that's the price you pay for featherweight rubber. Very fast delivery, and decent packaging. Awesome tire! The best out there! Tried 23x700 but not sure about fit onto American Classic 23 mm rims. Taped seam on tub seems to be quite proud - not fitting into rim well as good as I would expect. Might go for 25x700 next time. Rolls nicely. Roll nicely but grip is not market leading compared to the GP4000's I use on my clinchers. So far no other faults and would consider good value for money. For me? Best of the best! Great price super fast delivery ! Tyres roll very well and grip is also another level. Wear rate is fast but you can't have it both ways. Will buy again! Very good overall and the cornering is fantastic. Good price for these Tubs here at Merlin Cycles. I use these tubs on my best set of race wheels. No complaints so far - they roll smooth, they're light, look great with the white sidewalls, and match well with my Italian wheels. The tread does cut up reasonably easily, but they are race wheels so this is going to happen. I run them with 30ml of Stan's sealant inside each tub for a bit of security against punctures on rides and races. Top class tyre, light and fast. On my first ride I came up in heavy rain. Not an issue in cornering or general grip. Fitted easily on my carbon rims. Look great(got the ones with the red stripe at the side)on my S-Works SL4 black-red satin. Be aware you don`t need the "special" Vittoria valve extenders for these, I contacted with Vittoria and I was told simple valve extenders will do the job, and so it is. Just completed first 100 miles on these tyres on dry and damp roads. Grip is very good in all conditions. Will definetly buy again.